Bill Scott is honest, though obviously not the brightest guy in the world. But he can’t help himself. He’s in love. Unfortunately Eve Roman, his new love, is married to a Miami mob boss. But she loves Scott, too, so they runaway together—to Havana. 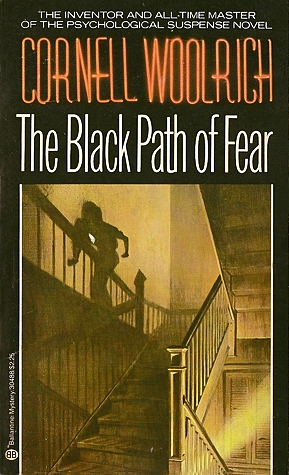 In the first few pages of Cornell Woolrich’s The Black Path of Fear, Eve is stabbed to death in a Cuban nightclub and the police blame Scott. We get the backstory of how Scott and Mrs. Roman got together in a long flashback, but the majority of the book—which hour-by-hour covers no more than a day and a half—describes Scott’s desperate attempts to find the murderer and clear himself. His chances look dim. He doesn’t speak Spanish, the police are combing the city for him, he knows no one in Havana and when it comes down to it, a big part of him doesn’t really care. Eve is dead. I’m working my way through Woolrich novels and short stories. It’s a rewarding journey although Black Path is not his best. My 1982 printing of the book (it was first published in 1944) reads almost as if it lacks a final edit. The dialog occasionally sounds a bit off, Scott’s hat mysteriously appears in one scene—after he’d dropped it somewhere else—and he doesn’t use his love for the dead woman as an argument for his innocence. That’s the bad news. The good news is Woolrich takes a certainly unoriginal plot (though undoubtedly copied many times since) and builds it into a succession of nail-biting scenes in some of the most memorably ugly, foreboding settings you can imagine. In one scene Scott is escorted by police down a suffocatingly narrow alley—too small to accommodate a car—in a run-down portion of Havana’s Chinatown. The alley smelled “like asafetida and somebody burning feathers, and the lee side of a sewer.” It was also dim. It wasn’t of an even darkness; it was mottled darkness. Every few yards or so an oil lamp or kerosene torch or a Chinese paper lantern, back within some doorway or some stall opening, would squirt out a puddle of light to relieve the gloom. They were different colors, these smears, depending on the reflector they filtered through: orange and sulphur-green, and once even a sort of purple-red, were spewed around on the dirty walls like grape juice. In another scene Scott is feeling his way in pitch darkness across a silent and seemingly empty skid-row office when something pricks his ear. It’s a clever, suspenseful set-up that leads to a creative result. Scott is similar to many Woolrich protagonists, an ordinary guy dumped into extraordinary circumstances and challenged to save someone else, himself, his sanity, or all three. Emotions, not only of fear, but loneliness, disgust and hopelessness often drive his plots. She had the look on her face of someone who has just been granted a quick glimpse down into the bottommost depths of hell from the top of the stairs. And didn’t turn away quickly enough. Woolrich was a noir master. Although he’s not as well known as Raymond Chandler or Dashiell Hammett, according to his biographer Woolrich influenced not only the French Roman noir novels but the bleak Hollywood crime dramas, film noir. Like the majority of Woolrich’s novels and short stories, Black Path was dramatized, in this case, many times: One of several radio versions starred Cary Grant (1946), the movie version (1946) starred Robert Cummings and Peter Lorre and a TV drama (1954) had James Arness as Scott. Black Path was one of Woolrich’s “black” series in the 1940s, when the author was in his prime, cranking out so many thrilling novels that he released some under two pen names, William Irish and George Hopley. Biographer Francis Nevins, Jr. called Woolrich the Poe of the Twentieth Century. Black Path is an entertaining, compelling read, but stick with Woolrich titles for the whole dark ride through the 1940s.